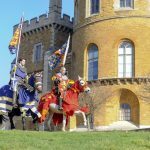 Belvoir Castle will throw open its majestic doors in early December to host a Christmas Musical Extravaganza that is sure to get the whole family excited about the festive season. 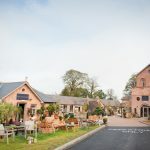 With a variety of music being played in the beautifully festooned rooms, the Old Kitchen will become a dedicated craft centre for children, Father Christmas and his little elf will make an appearance, along with the chance to enjoy seasonal food and drink, topped off with a rousing Christmas carol sing song. 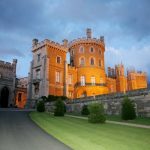 The Duke & Duchess of Rutland open the doors of their home for Belvoir Castle’s Christmas Musical Extravaganza, which takes place on Sunday 10th December, Monday 11th December and Wednesday 13th December, from 4pm till 9pm. Christmas trees, decorations and twinkling lights will provide the perfect backdrop for the various musicians. This year musicians include the Persiflage Saxophone Ensemble, St Waltham’s bell ringers and – appealing to the younger members of the family – local singing sensation Tabitha Gervis who appeared on ITV’s The Voice Kids earlier this year. Belvoir will also welcome performances from Belvoir Dance Academy and Bingham’s School of Dance. Visitors can wander from room to room enjoying the music whilst admiring the garlanded interiors and soaking up the atmosphere of Belvoir at Christmas. Join the knowledgeable guides who will be dressed in traditional outfits whilst they entertain with their Castle anecdotes and hundreds of years of history tales, as well as the story of how the Christmas traditions began at Belvoir. Downstairs in the Old Kitchen, children will be encouraged to explore their creative side by making gorgeous gifts ready for the season of giving, such as baubles and sand Christmas tree models, as well as decorating gingerbread. Children will also want to visit the Castle’s winter wonderland where Father Christmas and his little elf will be waiting with a special gift. Belvoir’s Gift Shop will be open for those looking for last minute Christmas gifts and stocking fillers. The store stocks a range of chutneys, jams and preserves, a great selection of books, home ware, gifts and souvenirs, plus Belvoir’s homemade Sloe Gin, always particularly popular at Christmas time! Ticket prices include a complimentary mince pie and festive drinks for adults or a brownie and a soft drink for younger members of the family. Additionally, traditional festive food and drink will be on sale, including delicious, locally-produced pork cobs, a delightful selection of tempting treats. The evening will end with everyone congregating in the Guard Room, perhaps the most impressive room in the Castle, for a Christmas Carol sing song! It will provide a fitting end to an evening of festive joy and cheer in one of the most beautiful fairytale castles in the country. In summary, a Christmas warm up to remember. Further information and tickets are available at www.belvoircastle.com/christmas-musical-extravaganza/; keep up to date with the latest news on Facebook and Instagram (BelvoirCastle).